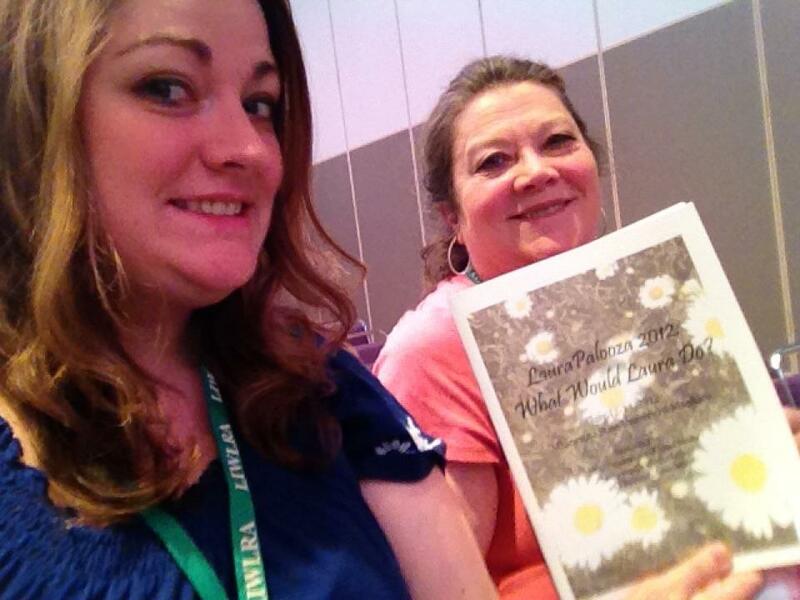 My mom and I start the first LauraPalooza session Thursday morning. Greetings from Mankato. 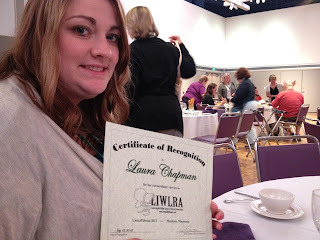 The second official day of LauraPalooza 2012 begins at 8 a.m. Before my mom/partner-in-crime and I head back into activities and sessions, I wanted to take a few minutes to share some of the lessons I learned and my impressions from the first day of the Laura Ingalls Wilder Legacy and Research Association's second annual conference. The day began well with two sessions: Literary Laura and History and Context. Each session featured several scholars who presented their papers and findings on LIW or Rose Wilder Lane-related materials. Elizabeth Nolan Connors, Ph.D., Orchard House guide/living history performer and a lifelong fan of LIW and Louisa May Alcott (the author of Little Women). She presented on the similarities and differences between LIW and LMA. Though a fan of both authors (admittedly a bigger Wilder gal), I had never stopped to consider all of them, but there are quite a lot. For example, both Laura and Louisa were the second of four daughters born to drifter/imaginative fathers who greatly influenced their lives as writers. I was most interested to learn facts about Alcott I did not know before. Like, did you know she used to hang with Ralph Waldo Emerson, Henry David Thoreau and Nathaniel Hawthorne on a regular basis? Her father was friends with these literary greats, which enabled her to learn from the best transcendentalists of the time. Kay Weisman shared her research on "The Youth's Companion" of 1879. Fans will recall LIW regularly mentioned the weekly publication that she and her sisters poured over together and read as a reward. In Weisman's presentation, she shared that more than the literary stories mentioned in the books, particularly The Long Winter, "Youth's Companion" offered readers sensationalized stories, news briefs and a painted a politically incorrect version of the way white Christian Americans perceived the country. Weisman provided examples of text, which, as a journalism major, completely fascinated me. I look forward to digging into some of the issues available online to get a better idea of what the Ingalls girls were into. Barb Mayes Boustead, a fellow Nebraska resident and a forecast meteorologist and climate program manager at the National Weather Service, gave one of my favorite presentations of the day. Her research gave more context and meaning to the droughts mentioned in On the Banks of Plum Creek and The First Four Years, the cold snap in These Happy Golden Years and the severe tornadoes from the same book. I am a weather junkie who writes weather safety articles for employee publications instead of tracking the storms for myself, sadly. The part that most fascinated me was the talk on tornadoes. Like Boustead, reading that part of These Happy Golden Years is one of my favorites. With the exception of the year it happened (LIW was off a summer), she has the details down almost perfectly. PLUS, the storm Laura and Almanzo witnessed while out on their drive turns out to be the second photo ever taken of a tornado. How cool is that? I could have listened to Barb talk for another hour on this topic, and since she is not too far from me, I hope I can talk her into giving me some more details. Susan Thurlow is an educator and author who shared her research on Dr. George Tann, the doctor who save Laura and her family's lives in Little House on the Prairie. What was most remarkable about her research was learning how amazing of a person this doctor was. A black man acting as doctor in the aftermath of the Civil War was not an easy task. However, through hard work and determination, he earned the respect of his peers, made a name for himself and left behind a powerful legacy. Jim Hicks, a physics teacher and education lecturer, closed out the morning sessions by sharing his research on the Brewster School, which is the first school Laura taught. In addition to sharing the exact location of the school and distance from her home, he offered insight into the actual identities of her students. Unfortunately, this portion was a bit rushed, because we were short on time, but I found it fascinating. I wish I could have heard more of his findings, because I love learning about the real people behind any legend or story. The afternoon session featured a presentation of Pa's Fiddle, a TV program and documentary. The program was too amazing for me to get into now, but I will have a more detailed post on it later this week. Just know it was awesome. Before that, the LIWLRA held its Legacy Luncheon. During it, they honored two amazing women for their contributions to preserving LIW's legacy. Barbara Walker is the author of the Little House Cookbook and Shirley Knaknuhs ran the gift shop and starred in the annual pageant in Walnut Grove, Minn., until she recently retired. Also at the luncheon, a fellow association member and I received special recognition for our contribution to LauraPalooza. I know. Way to bury the lead, Laura. It was an honor to be recognized at the same time as such amazing women, and I was completely caught off guard. I mean, we did do a lot to help, but when it comes down to it, I wish I could have done more. It was a fun, if sometimes stressful, experience, and I am honored they even let me help. Speaking of more, there will be more LauraPalooza details to come this weekend. Check back this afternoon for the scoop on the Author's Reception held last night. Spoiler alert: It was fun.